Quiet, super-safe, extremely attractive, and “everyday practical”… If you don’t associate those words with pressure cookers, it can only be because you haven’t experienced Kuhn Rikon Duromatic… and you’re in for a treat! 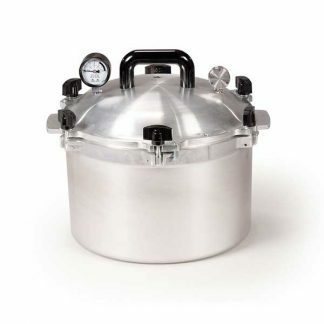 Large, wide base (11”) Kuhn Rikon Duromatic pressure cookers for big jobs. The Kuhn Rikon 12.7Q Family Cooker will handle making dinner for ten to twenty. Steaming trivet included with each. These are two of our most popular models. Available in 8.5 Quart (Model #30331) and 12.7 Quart (Model #30333). Quiet, super-safe, extremely attractive, and “everyday practical”… If you don’t associate those words with pressure cookers, it can only be because you haven’t experienced Kuhn Rikon Duromatic… and you’re in for a big treat! 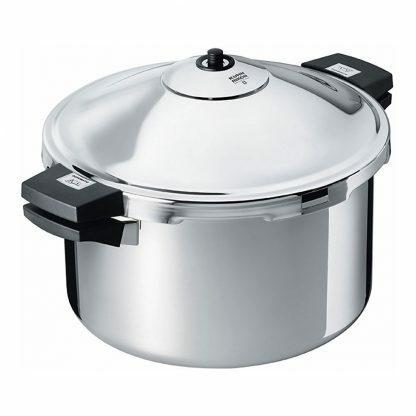 Cooking with a Kuhn Rikon Duromatic pressure cooker reduces cooking times (and energy costs!) by two thirds. It makes tough foods tender, and enhances flavor blending for tastier dishes. Kuhn Rikon Duromatic also preserves the vivid colors of your vegetables—as well as more of their nutrients. But in the past, pressure cookers have been big, noisy monstrosities… and more than a little scary! Crafted in Switzerland of 18-10 Surgical Stainless with the attention to detail for which the Swiss are world renowned, Kuhn Rikon Duromatic Cookware will revolutionize your perceptions of pressure cooking. With super quiet valves, clad construction, and 5 unique (and truly effective) safety systems, Kuhn Rikon Duromatic pressure cookware is changing the way cooking is done. The Kuhn Rikon Duromatic line features fry pans that pressure cook with innovative stick resistant stainless surfaces, and interchangeable glass lids. Every Kuhn Rikon Duromatic pressure cooker base features a thick layer of pure aluminum sandwiched between stainless steel for even browning and fast warm up. Versatile Kuhn Rikon Duromatic pressure cookers are sized for any task, from singles and small families to the professional cook. And Kuhn Rikon Duromatic pressure cookers work on all cooking surfaces, including induction cooktops. We offer free shipping, and we stock all Duromatic items. If we can help you with more information, please e-mail or call us at the number at the top of the page. We’re here to help! Gaskets should be replaced periodically, as they will harden over time and stop working — which will cause seal loss, and your cooker won’t work. Tip: When not in use, gaskets can be removed from cooker lid to maintain proper shape for longest life. 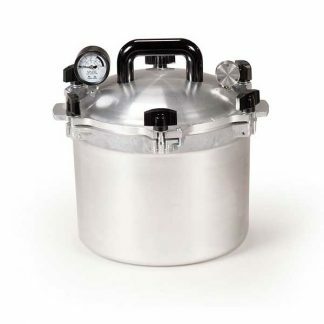 Can you use a Kuhn Rikon pressure cooker for canning?When the first red ring appears on the Kuhn Rikon pressure valve, the internal pressure has been raised to 8 pounds per square inch above the external pressure (235 degrees Fahrenheit). When the second red ring on the valve appears, the internal pressure has been raised to 15 pounds per square inch above the external pressure (254 degrees Fahrenheit). Kuhn Rikon doesn’t offer canning directions, but if the 8 & 15 lb. 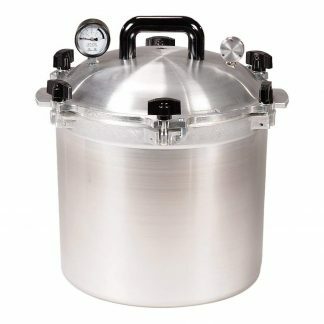 pressure indications fit into the canning directions you’re following, Kuhn Rikon cookers will do a great job for you! With any pressure cooker, be sure to add sufficient water. Complete evaporation will spoil your food and damage the cooker. If you want, you can keep food suspended above the water by using a trivet.